Home of the "Busted Knuckles"
Old Bike Barn "For Sale"
The origins of HO scale slot car racing can be traced to England, where in the late 1950's the English inventor, Derek Brand first developed a small motorized car to be used with model railroads. These early cars were designed for use with the popular English model railroading 'OO' gauge, or 1:76 scale. 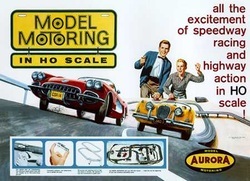 The 'OO' scale was slightly larger than the popular American 'HO' gauge which was 1:87 scale. Slot car racing (also called slotcar racing or slot racing) is the competitive hobby of racing with powered miniature autos (or other vehicles) which are guided by grooves or slots in the track on which they run. Slot cars are usually models of actual automobiles, though some have bodies purpose-designed for miniature racing. Most enthusiasts use commercially available slot cars (often modified for better performance), others motorize static models, and some "scratch-build," creating their own mechanisms and bodies from basic parts and materials. Slot car racing ranges from casual get-togethers at home tracks, using whatever cars the host makes available, to very serious competitions in which contestants painstakingly build or modify their own cars for maximum performance and compete in a series of races culminating in a national championship. Some hobbyists, much as in model railroading, build elaborate tracks, sculpted to have the appearance of a real-life racecourse, including miniature buildings, trees and people, while the more purely competitive racers often prefer a track unobstructed by scenery. Slot car racing was a popular fad in the 1960s, with sales reaching $500 million annually, including 3,000 public courses in the United States alone. The fad sputtered out by the start of the 1970s as amateurs felt squeezed out at races and stayed home.